If you find ’em, grab ’em! I’ll admit it. I let out a gasp and my heart gave a little leap when I spotted these dirty little tubers at Market Place on Oakton. Once they’re cleaned up, peeled and roasted, sunchokes have a delicious flavor like nothing else I’ve ever tasted. 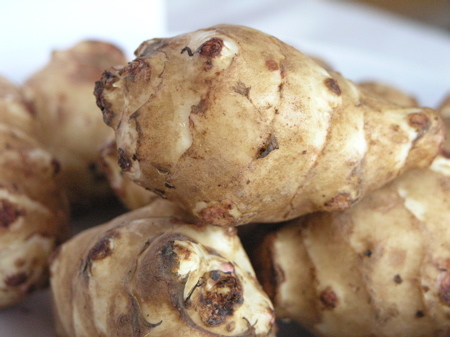 Also known as Jerusalem artichokes, these root vegetables resemble ginger root and as unappetizing as that sounds, trust me, they’re outstanding. They feature a nutty taste, with the texture of potatoes, that when roasted melt in your mouth. Literally. They’re hard to find in the stores and farmers’ markets, but if you do, grab as many as you can. And save some left for me. Roughly peel sunchokes with peeler, no need to get every bit, and chop off the rough ends. Drizzle with olive oil and sprinkle with kosher salt. Roast at 375 degrees for 30 minutes or until soft.